At the end of this article is a link to a detailed power-point presentation describing a comparison of QEEG-Pro and 3 other databases. Client ages are 16, 41, 43, 55, and 81. Good agreement is seen generally in power metrics. Some differences are expected because the band definitions are not exactly the same. 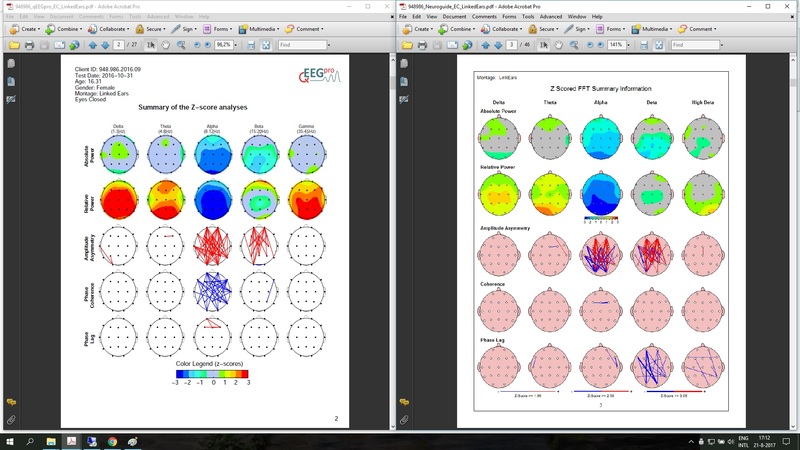 For example, QEEG-Pro includes gamma, while NeuroGuide shows high beta in that column. 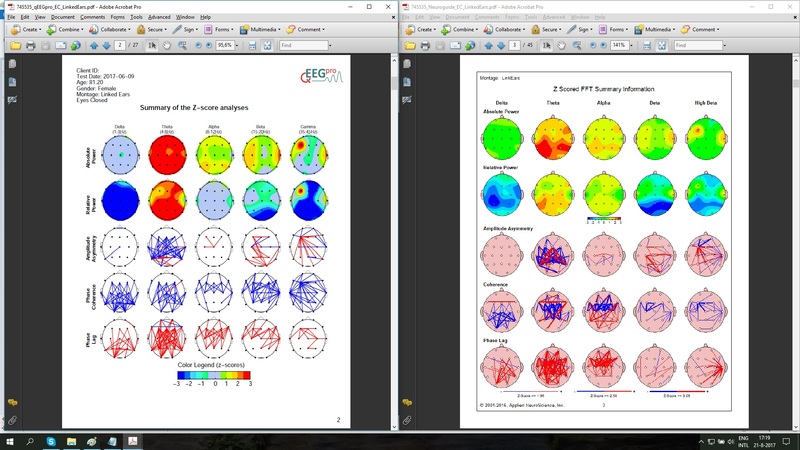 Also, generally, QEEG-Pro seems to be more sensitive than NeuroGuide, i.e. more likely to spot and identify a deviation in either a positive or negative direction. Most importantly, when one database identifies a significant focal or diffuse deviation, the other is likely to also show it, even if the maps do not "look" exactly the same. The important point is that a narrative description would yield very similar descriptions of the maps. Connectivity metrics also agree well, with certain systematic differences. These can be understood in terms of the exact means and standard deviations used by the databases. Even though the raw metrics may agree, the differences in the z-score targets can explain why the differences exist. 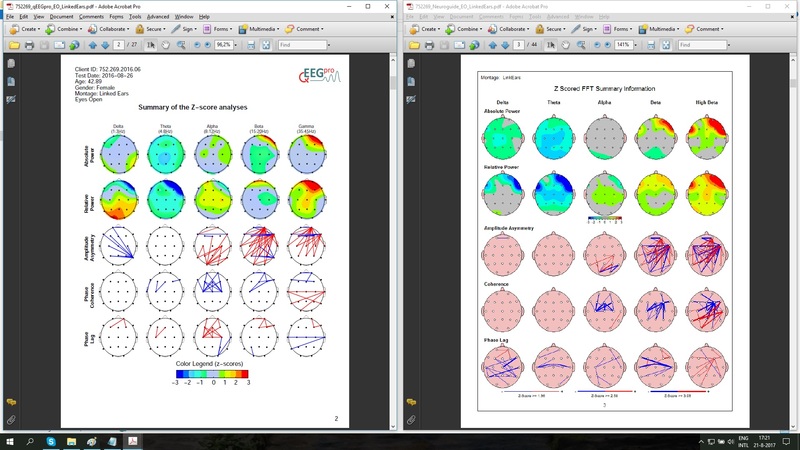 QEEG-Pro appears to be more likely to identify a connectivity deviation when a corresponding power deviation is seen. At times, NeuroGuide is the one that identifies a connectivity deviation more than QEEG-Pro. 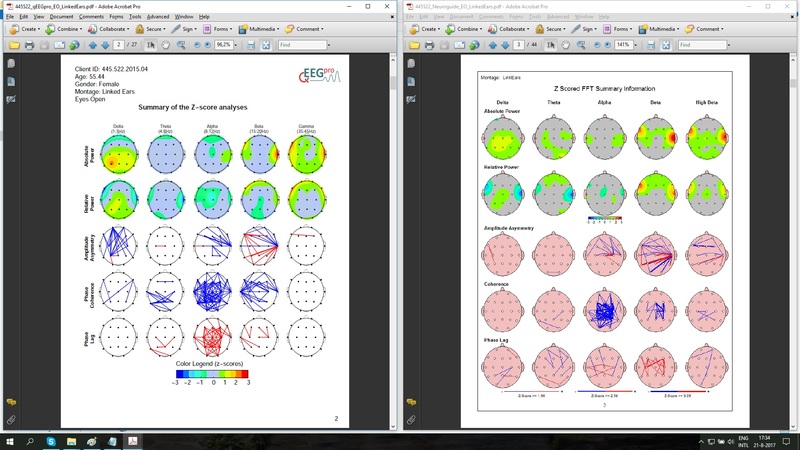 First of all, when comparing the connectivity z-scores of phase coherence and phase lag between qEEG-Pro and Neuroguide, a lot of overlap is seen. However, there are often also rather large differences between the two databases. I have noticed that the phase coherence and phase lag often show similar deviances in opposite directions for qEEG-Pro, but not for the Neuroguide. For example, in the 55 year-old, we see a large degree of deficient phase coherence in alpha and a large degree of excessive phase lag in Alpha. This is something you would expect to see very often: When there is something wrong with the communication within a frequency band or brain area, you would expect there to be either deficient coherence and excessive lag or vice versa. I don't see this happen in Neuroguide as often as I see it in qEEG-Pro. Similarly, I often see that deviances in amplitude asymmetry are mimicked by deviances in coherence or lag. Again something that you could expect and something that I don't see very often in Neuroguide (see the 16yo example). Different factors play a role that may explain the observed differences between qEEG-Pro and Neuroguide. 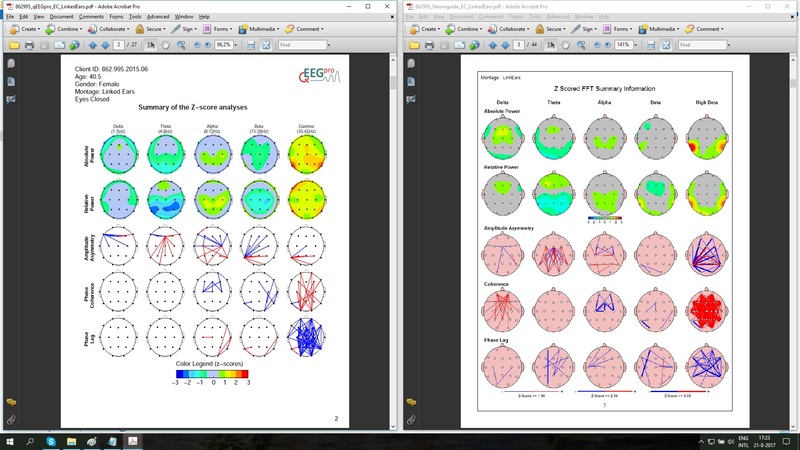 First: In the summary results, the definitions of the frequency bands are different between qEEG-Pro and Neuroguide. Delta ranges between 1-3Hz for qEEG-Pro and 1-4Hz for Neuroguide. Beta ranges between 15-20Hz for qEEG-Pro and between 12-25Hz for Neuroguide.The highest frequency band in the summary results is Gamma (35-45Hz) for qEEG-Pro and high Beta (15-30Hz) for Neuroguide. Second: The calculation method for Phase Lag is different between the two databases. Third: qEEG-Pro implements a z-score threshold of (-)2.3 for showing a line between two electrodes, while Neuroguide implements a z-score threshold of (-)1.96. Fourth and most importantly: The means and standard deviations are different between the two databases.